Our client, Mercedes-Benz of Plano, has a solid history of going above and beyond to make their customer experience exceptional. And what better way to communicate this than using real statements from real customers in their marketing? This is how our "5-Star Statements" campaign was born. We sourced and synthesized actual customer comments into striking print and digital ads with vibrant vehicle photography, and clean, yet expressive typography. We also adapted this concept into radio spots that conveyed the pride and motivation that Mercedes-Benz of Plano gets from receiving such positive reviews. 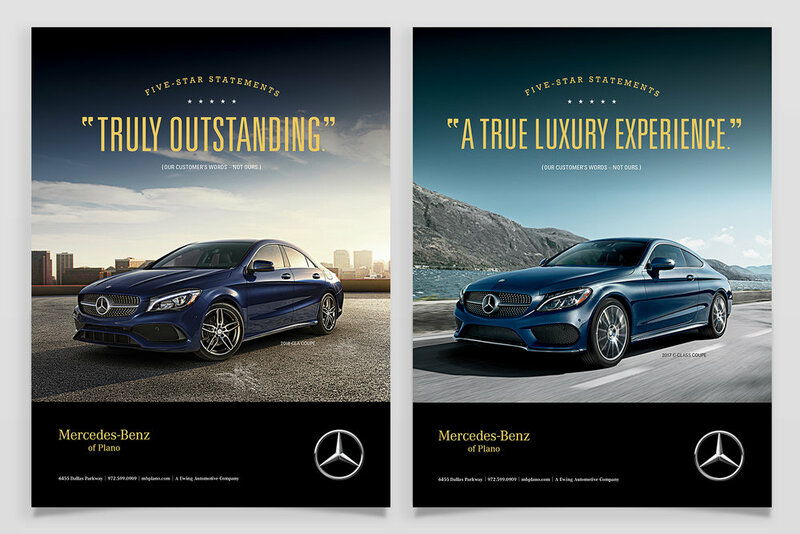 Check out a few pieces from the campaign below, and get a glimpse of how Mercedes-Benz of Plano makes a 5-star impact on their customers.